If you're looking for a medium-support sports bra that looks and feels great, be sure to check out Boody's racerback sports bra. It is perfect for a wide variety of activities, from gym workouts to backcountry hikes and beyond. Plus, it's comfortable enough to wear with your favorite casual attire for any occasion, even when you're just lounging around the house. I have a long-term love/hate relationship with sports bras. I have always loved the idea of them, but typically find them uncomfortable and unattractive. At least, that was the case until the team at Boody offered to send me samples of their bamboo fabric sports bras to review. I don't have a love/hate relationship with this bra. I just love it. It's important to point out that that this is not a maximum support sports bra. 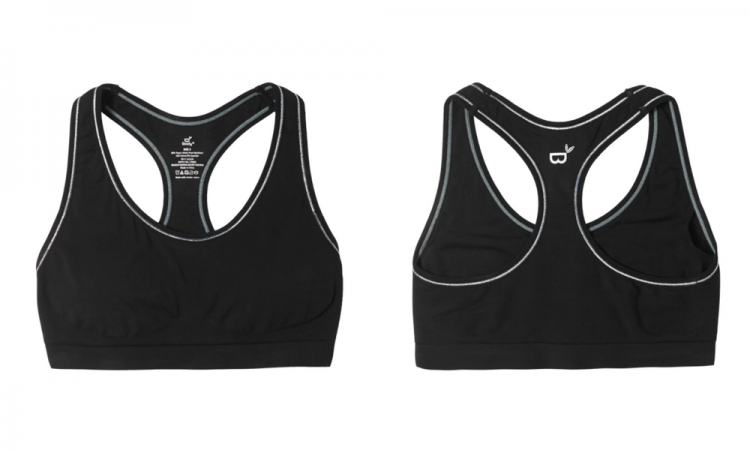 If you are a long distance runner or sprinter, or engage in other high intensity activities that require a high level of support, this is likely not the bra for you. However, if you engage in light to moderately intense activities, it may be exactly what you need. For example, I am not a runner (at all), but I do spend quite a bit of time walking and hiking. I also take strength training classes and enjoy bicycling. I mostly ride a stationary bike, but do go on outdoor bike rides sometimes. For the types of activities I participate in, this bra is just perfect. It feels great and provides enough support without feeling overly tight or restrictive. This bra is the racerback style typical of sports bras. It has a round neckline for maximum coverage, a feature that makes it look great under tank tops. Boody even carries tank tops that pair with it perfectly. It comes in your choice of solid black or black with silver stitching (pictured above). This bra is made with 80% rayon manufactured from bamboo and 20% spandex. Bamboo, of course, is known for having outstanding moisture wicking properties, while also being both cooling and breathable. Thanks to the spandex, the bra's fabric is stretchy, which is probably why it feels less binding that other sports bras I have tried. It also has removable padding, so you have an option of keeping the padding in or taking it out. To me, typical sports bras feel like they are very binding. This one does not have that feel at all, which is one of the main reasons I like it so much. Another reason is that fact that it doesn't give that unfortunate uniboob look that I have come to expect with sports bras. If you like the feel of a binding sports bra and are perfectly happy with a uniboob, you might not love this bra like I do. If you find these things to be drawbacks, though, this just might be the sports bra you have been searching for. That's definitely how I feel about it!